M&M Jig Grinding is Currently Hiring. Please email a resume to sales@mmjiggrinding.com to Apply today! Benefits: After 90 day probation M&M offers exceptional Medical, Dental, Vision, Life and 401K Benefits. Review blueprints, drawings, specifications or sample parts to determine dimensions and tolerances of part/product, sequence of operations and/or set up requirements. 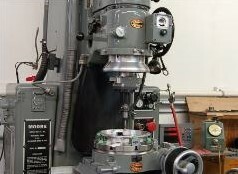 Measure, mark and otherwise indicate the dimensions and reference points on the part or material to be used as guides for subsequent machining. Calculate and set controls to regulate various machining factors such as speed, feed, coolant flow and depth and angle of cut. Start and observe machine operation to detect any malfunctions or out-of-tolerance machining, and adjust the machine controls or control media as necessary. Verify conformance of finished part to ensure that it meets specifications. Perform daily workspace maintenance duties and/or notify supervisor of any equipment-related issues that may require attention. Performs duties in compliance with the company's safety policies and practices. While performing the duties for this job, the employee is regularly required to stand. Minimum of three years’ experience operating and setting up Surface Grinders, Jig Grinders, Mills, Lathes or Wire Machines. Ability to calculate figures and amounts such as angles, lengths, diameters in decimals and fractions, proportions, percentages, area, circumference and volume. Ability to apply concepts of basic algebra, geometry and some trigonometry. Able to learn quickly and problem solve as necessary. Must be proficient in the use of precision measuring tools and equipment. Must be able to read and understand part specific prints. Ability to work under a minimum of supervision. Must be a U.S. Citizen or have proper documentation to comply with Federal Regulations.